Provides all you need to drive the route, with stacks of advice, lots of maps and detailed info about major towns en route. 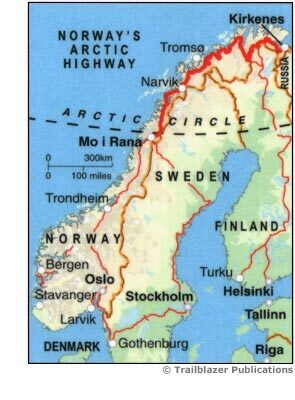 Running 1500km (over 900 miles) from Mo i Rana to Kirkenes, Norway's Arctic Highway is one of the world's great roads. Crossing one of Europe's most remote and starkly beautiful regions that includes Lapland, nearly the entire length of the Highway is within the Arctic Circle; at its most northerly point the road gets to within 19-1/2 degrees of the North Pole.